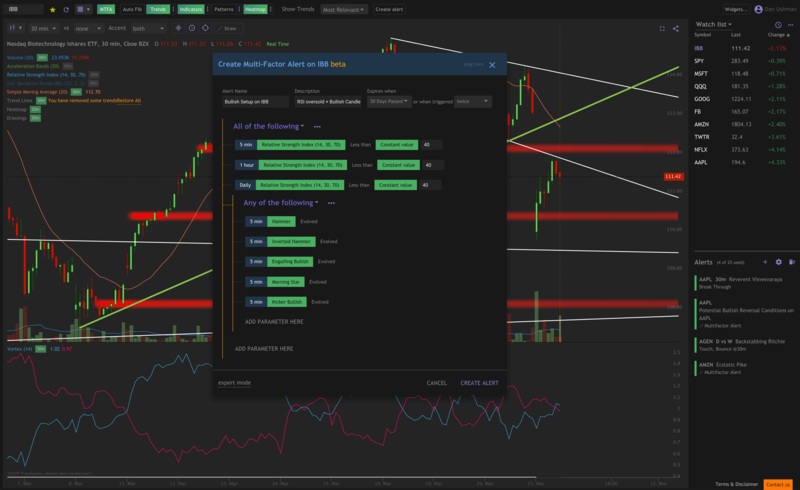 TrendSpider is one-of-a-kind technical analysis tool that uses cloud-based AI and smart UX to help market analysts and traders find, plan and time their trades better. It automates away the grunt work, reduces errors, improves accuracy, and helps you see what you're missing. 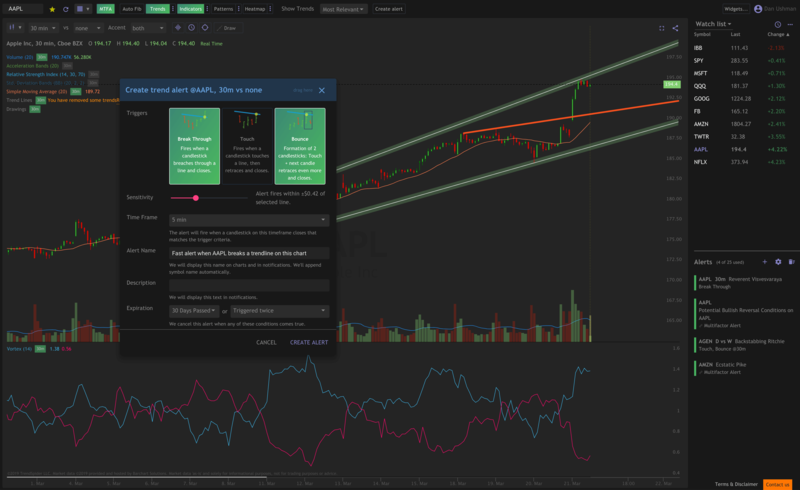 An enterprise-class, full featured, modern stock chart platform designed by traders, for traders. 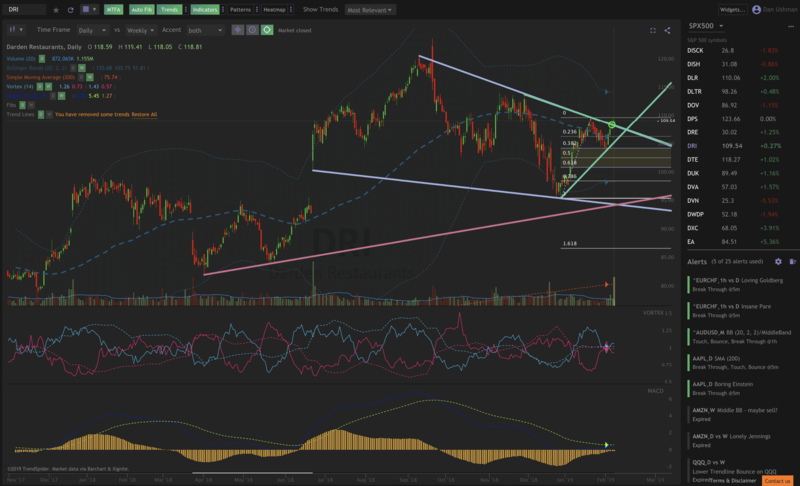 TrendSpider charts are what all stock charts should be like. TrendSpider is more than just charts. It's a complete toolkit that has everything you need to be a smarter, faster, more efficient technical trader. Real-time stock, crypto and/or forex data is included with your plan. Unlike other platforms, there is no need to pay separately for data feeds. Technical analysis tools and chart reading software designed to be fast and easy for you to use, so you can make informed trading decisions quickly. These are not your father's charts. Patent-pending smart charts can analyze and monitor themselves - totally unlike anything you've experienced before. 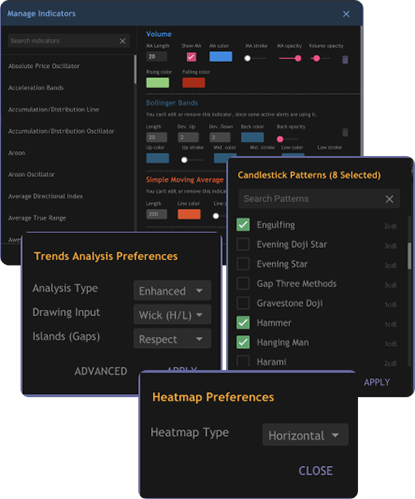 Charting software that learns your style of analysis, not the other way around. Everything, from the colors to the analysis algorithms, can be customized. TrendSpider was awarded "Most Innovative Charting Platform" by Liberated Stock Trader, as well as many other accolades from other trading experts. 1-on-1 training and customer service included. We're always just a chat or call away to help when you need it - from customization to using, just ask. 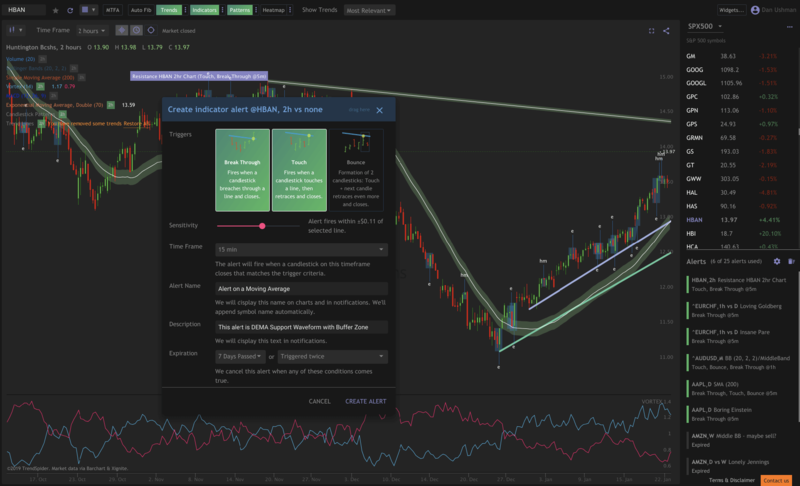 TrendSpider puts analysis, backtesting and chart watching on autopilot so you can make faster and more consistent trading decisions - just without the eyestrain, guesswork and frustration. Use TrendSpider's automated smart algorithms and cloud-based AI to save you time and frustration by performing mathematically precise, objective technical analysis on any chart, on-demand, in seconds. 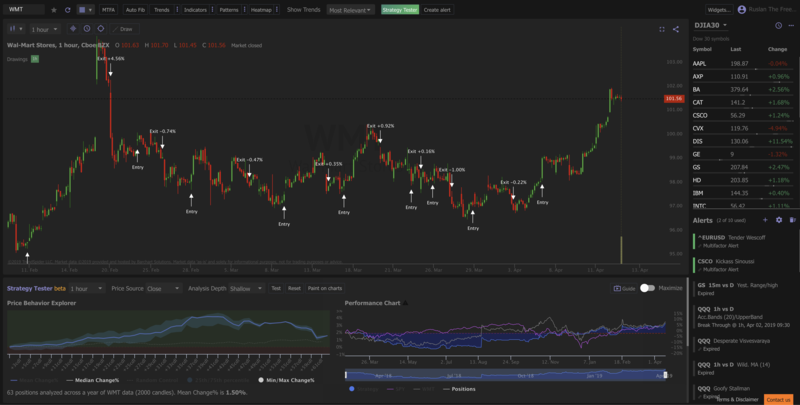 Use market data from multiple timeframes on a single chart to reveal hidden trends, support/resistance zones, and price levels that are likely invisible to other technical traders and analysts. The strategy that works on one chart might not work on another. 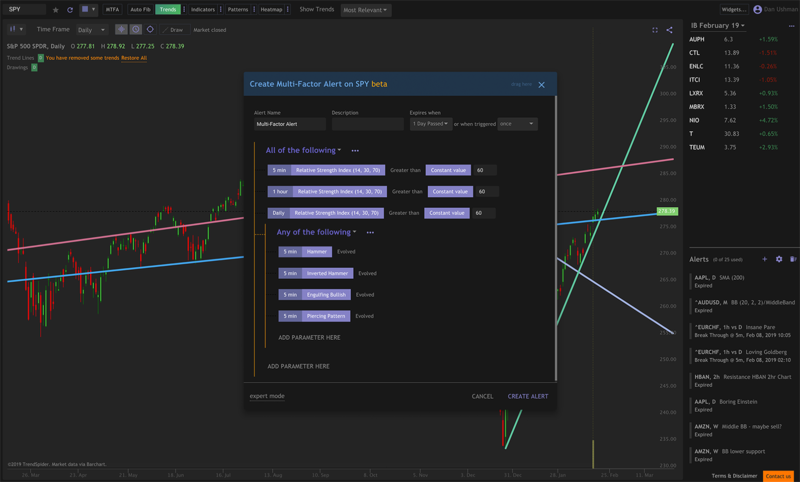 Before diving in, use TrendSpider's easy-to-use backtesting engine to test out how your strategy would have worked out in the past, so you can increase your odds of a profitable trade in the future. 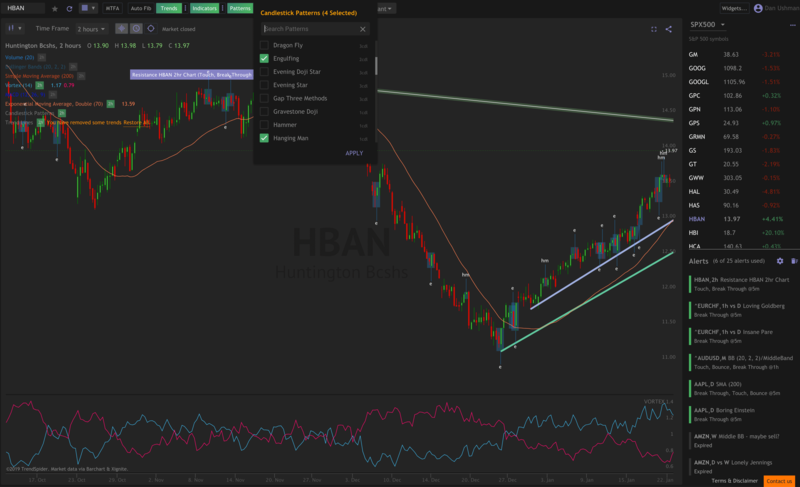 Combine your favorite indicators, timeframes, chart patterns, and more to create 'mega-alerts' designed to detect your ideal setups and trading conditions. No programming required. This is how the pros do it. 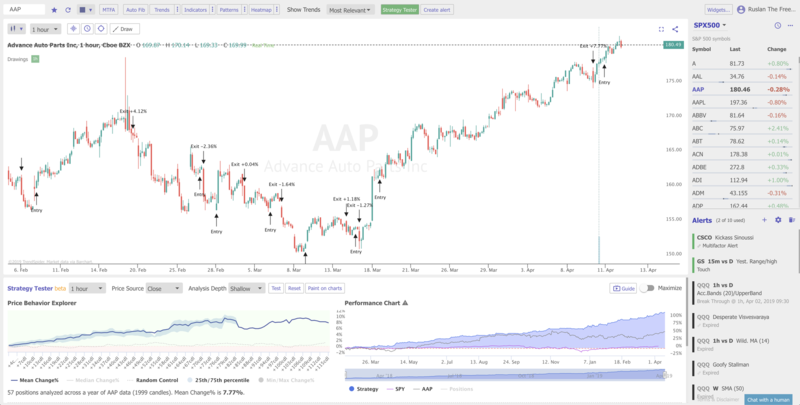 Visually select any indicator, trendline or price level of interest, and TrendSpider's cloud-based AI will keep an eye on it for you, your way. 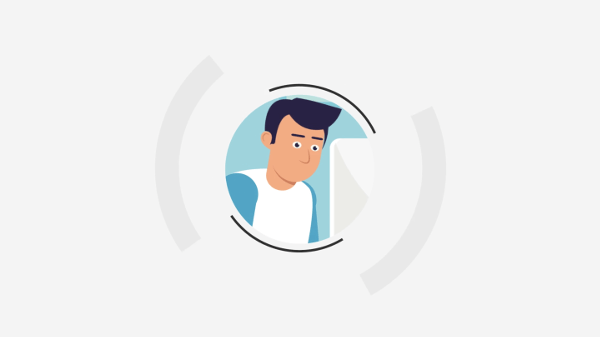 You will receive an instant alert when there is a touch, bounce or breakthrough that matches your alert parameters. 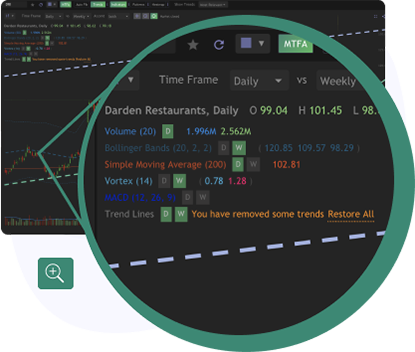 Once you configure TrendSpider, it will follow your rules to a T - 100% of the time, so you can focus on what really matters: moving fast, covering lots of ground, and making a smarter, more efficient trading decisions. 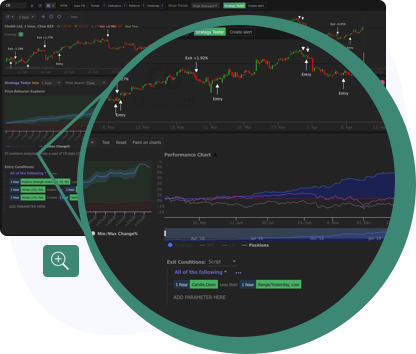 TrendSpider has everything you need to make smart, efficient technical trading decisions in one slick, easy-to-use platform. 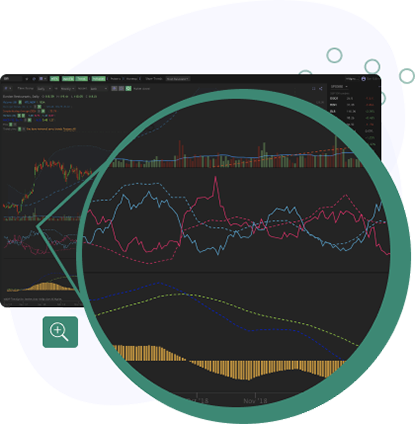 From backtesting to chart monitoring, we've got you covered with the most powerful and innovative technology available to active traders today. 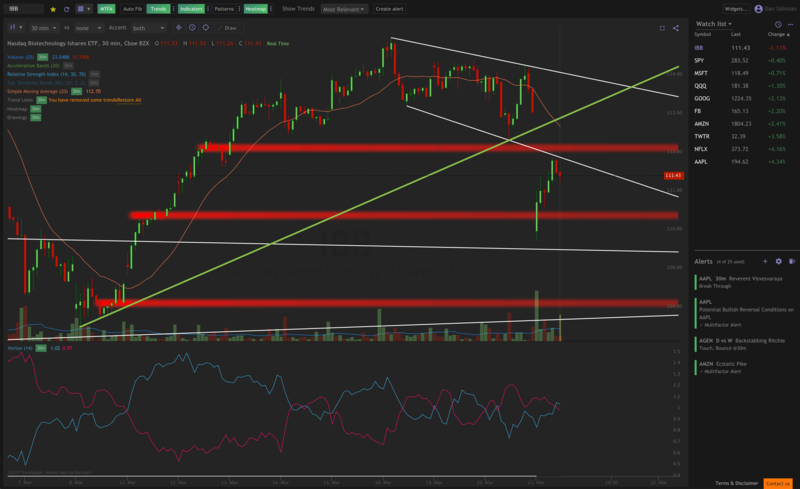 Save time and frustration with TrendSpider’s automated technical analysis. Our smart charts analyze and watch themselves using powerful algorithms, giving you time to breathe. 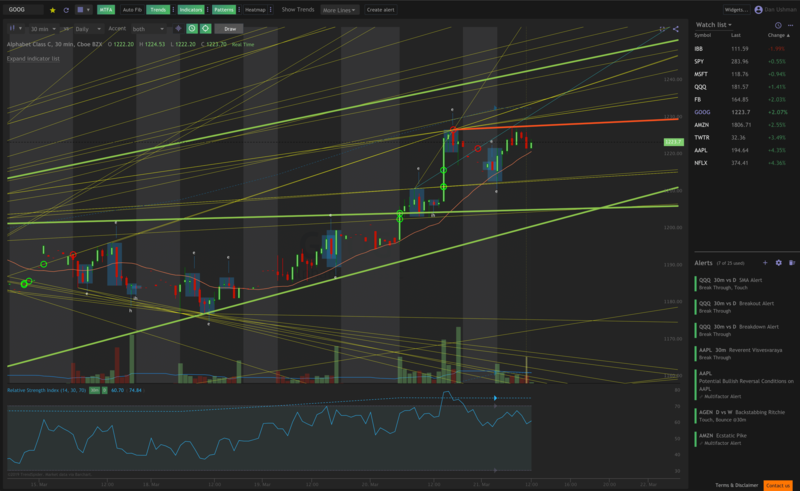 We apply charting rules consistently, every time. 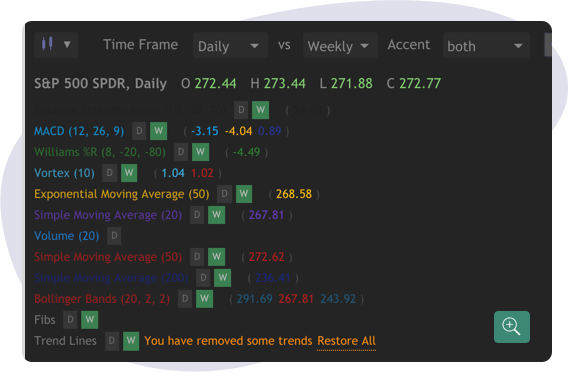 TrendSpider is the most efficient way to improve your trading. Compared to manual analysis, automation can process charts and detect trends faster and with greater accuracy. See the forest. And the trees. All at once. 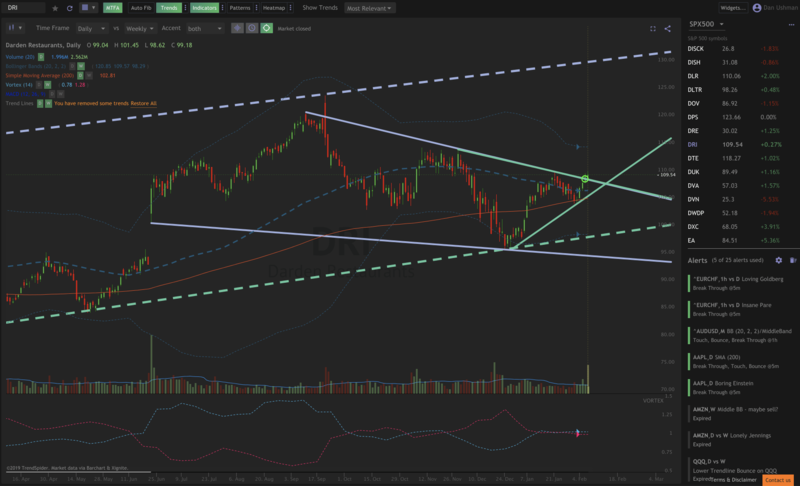 Multi-timeframe analysis brings it all into view: from hidden trendlines to support and resistance zones. No other platform even comes close. Alerts unlike anything else on the market—and we're not ones to exaggerate. 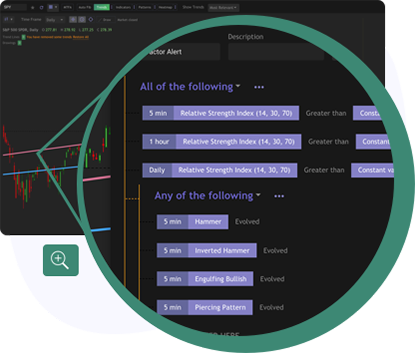 Dynamic Price Alerts (patent pending) monitor charts the same way you would: waiting for confirmation and candlesticks to close, watching for specific events (including bounces, touches, breakthroughs, and more), and lighting up when actions align with your criteria. Multi-factor Alerts (patent pending) are the next generation of TrendSpider’s capabilities. 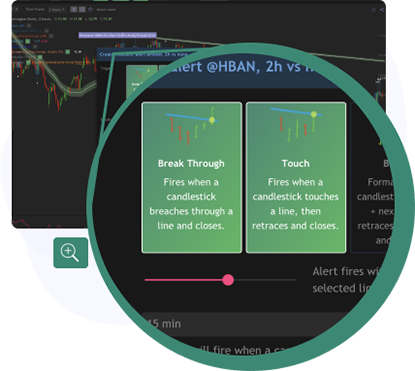 Stop being faked out by errant candlestick wicks; these customizable alerts follow multiple trigger criteria at once, notifying you only when the specific component of your logical criteria is met. Once your alert is customized, you can use it on as many symbols as you want. These are not the price alerts you are used to. 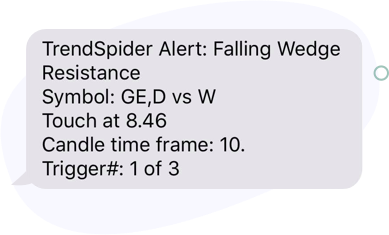 For one, TrendSpider alerts never need to be manually adjusted once they’re created. Set it, and forget it. 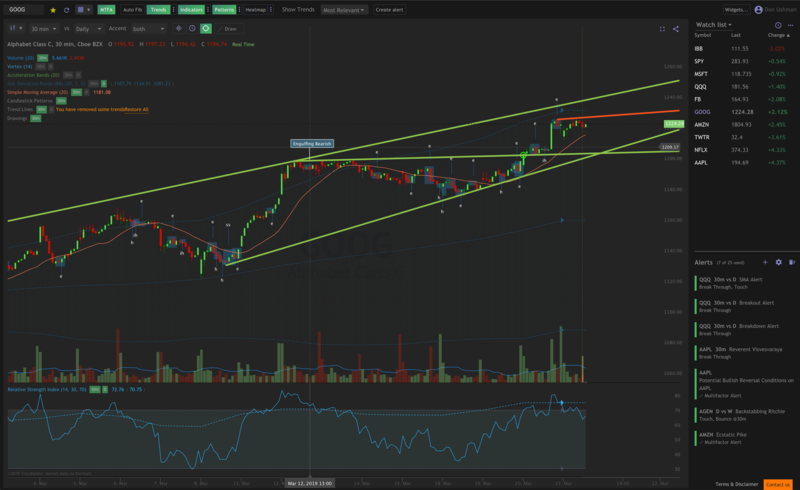 They will automatically follow the slope of your trendline or waveform of your indicator until you decide it’s time to stop. 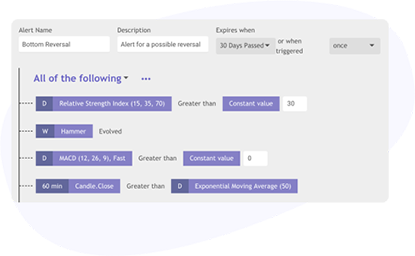 Alert sensitivity can be adjusted to match your preferred price proximity, giving you unprecedented control over how your alerts behave. 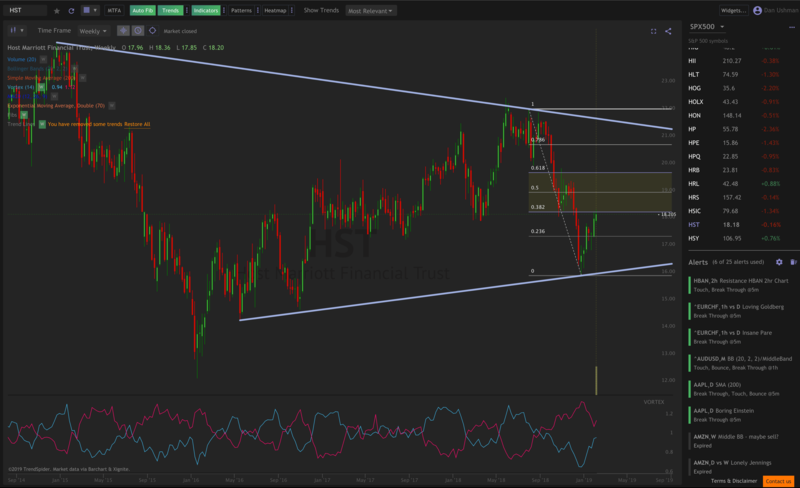 TrendSpider's core foundation is a full featured, highly robust charting platform. Switching to TrendSpider means getting the world's most advanced technology while making no compromises. 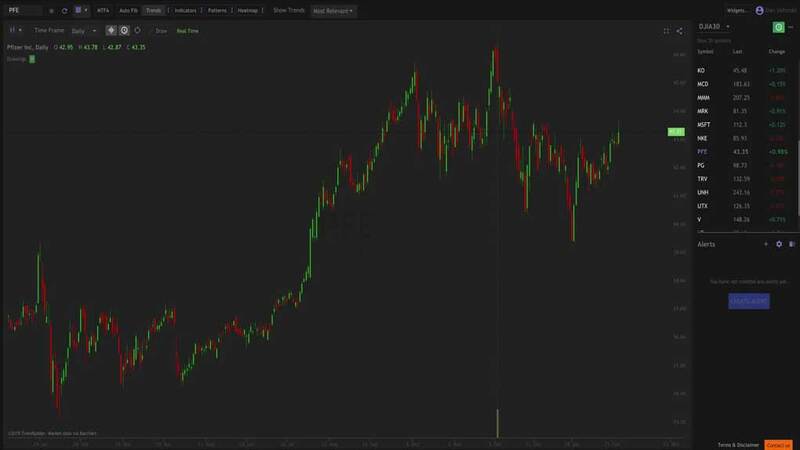 Beautiful, modern, responsive stock charts. The way it should be. 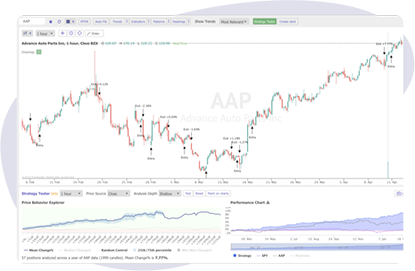 TrendSpider's industry-leading backtesting engine allows you to test any trading strategy on any chart against historical data to see how it might have performed in the past. If see something that you like, quickly turn any backtest into a Multi-Factor alert. TrendSpider will let you know next time the same conditions appear on the same chart.